The university is known as a place that values dialogue and debate by people of different cultural backgrounds, academic interests, and world perspectives. Do you think this kind of environment is important to learning? I think it's critical to learning. Bringing everyone to the table establishes common ground, which in turn draws out a variety of perspectives that enhance our self-awareness, increase our understanding of the world, and challenge us to engage in that world. Our students will live and work in a very diverse society, so it is important to reflect that diversity — not only in the people who are part of our academic community, but also in the range of thoughts and ideas that are expressed and discussed, and that challenge our minds and hearts. As a Christian university, this shouldn't be a cloistered environment. Our world is diverse, and it is also dynamic. Even as our community comes together to educate students during a formative time in their lives, we know that the world is changing. We need to understand these changes so that we can make a difference in our students' growth and preparation for life. As a university president, how do you facilitate open and constructive dialogue on campus? participate in this process and develop a structure to facilitate such dialogue. The most recent example of this is the strategic planning process we are just beginning across campus. This process will not only benefit our students and their academic experience, but it will also lead us in thinking about the purpose and future of SPU. throughout the course of my work on a daily basis. I have found SPU to be a place that desires conversations about substantive issues —rather than majoring on the minors, so to speak — which makes it a very refreshing and exhilarating place to be. Why is the pursuit of Christian reconciliation so significant to SPU and its mission? A primary vocational call in life is to be Christ's ambassadors in this world and to be reconcilers. We can do that individually, and we can do that collectively. Being an ambassador and reconciler means looking at the world through the eyes of Christ and asking: Is this the way that God intended it to be? And if it's not, we have to consider our role and responsibility to help the world become a better reflection of the world God intended. How important is it for SPU students to develop their cultural competency, learning to interact with people who are different from themselves? integration of cultural competency in our curriculum. — and the truth is you can't engage something you don't understand. Learning about and from other cultures enables students to work with others in all areas of life, and to be reconcilers. As SPU president, you host many different people from the Seattle Pacific community and beyond in Hillford House. What are some memorable moments around your table since you became president? We've loved having people in Hillford House since we came to SPU, including alumni, parents, faculty, staff, and current students. Probably the most memorable and rewarding times for me so far have been with students. I love talking with them about what SPU means to them and their hopes and dreams for the future, and seeing the way God has gifted them with different perspectives, different backgrounds, different talents, and different passions. develops a foundation of trust. The Trinity offers a beautiful example of how there can be difference without dissonance. In the same way, people can be different and yet complement and strengthen each other. It's a wonderful model of how to live life together. To celebrate its mission and the inauguration of President Daniel Martin, Seattle Pacific University is hosting events for the SPU community and the general public during the Inaugural Year. 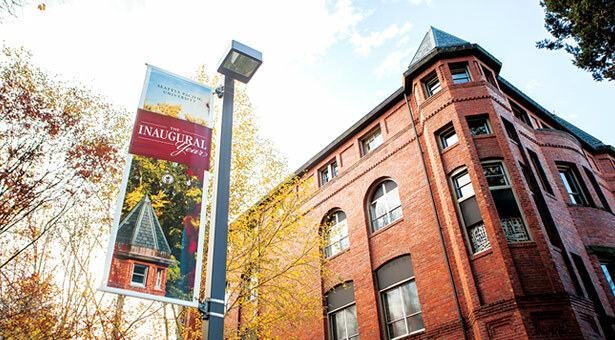 For more information about Inaugural Year events, visit spu.edu/inauguration.